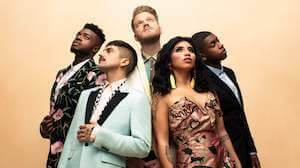 Pentatonix, an American a cappella group from Arlington, Texas – consisting of vocalists Scott Hoying, Mitch Grassi, Kirstin Maldonado, Kevin Olusola and Matt Sallee – are truly a modern-day success story. After winning the third season of NBC’s The Sing-Off, the group received $200,000 and a recording contract with Sony Music. After eventually being dropped by the label, the group formed its own YouTube channel and began amassing millions of subscribers and over 3 billion video views.Now, the group is a three-time Grammy Award-winning and multi-platinum-selling powerhouse. Their 2015 self-titled album is certified gold after it debuted at number one on Billboard’s 200 album chart. Recently, the group released PTX Presents: Top Pop, Vol. I in April and are heading out on a North American tour in support. The album showcases the group’s distinct arrangement and vocal medleys on a wide array of today’s favorites including Bruno Mars, Kesha, and fellow Stir headliner Portugal. the Man.